that cannot be described in words. It’s beautiful, transcendent and uplifting." Aska composed this song for “Homura-Tatsu’ a 2014 Japanese theatrical production set in Hiraizumi. In the 12th century this extraordinary city emerged as center of Pure Land Buddhism embodying peace and egalitarianism for friends or foes alike during Japan’s long time civil wars. ** Acceptance - Aska composed this song for "Queen Media" a 2012 Japanese theatrical production. 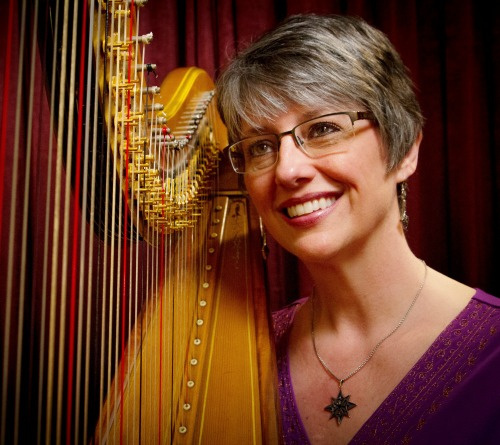 Co-producer: John Camie, Blue Star Productions, Inc.
AMY CAMIE, a 1987 graduate of Indiana University, is a gifted spiritual harpist, award winning performer, composer, recording artist, author, public speaker and Founder of the Scientific Arts Foundation. For the past 20 years, she has been active in the sound healing community with several pilot studies indicating how her solo harp music increases brainwave function, supports the immune system and reduces pain, distress and anxiety levels. She has presented hundreds of seminars and workshops for local, regional and national audiences on the power of music, sound and vibration. Amy is the author of “Loving Life…all of it – A Walk with Cancer, Compassion and Consciousness’ and is a contributing author to two international books, “The Spiritual Significance of Music” and “LOVE LIVE FORGIVE.” Amy is a Spiritual Initiator and Guide of The ORIGINS Process, a multifaceted system of self-discovery and inner connection. Her CDs are used in hospitals, cancer centers, hospices, nursing homes and with military veterans as well as for general relaxation and stress reduction around the world. As one woman once said, "You touch others in such a deep place with your music...because it comes from such a deep place inside of you." "The Moon Washes Away Misfortune"
“I have been listening to wonderful, fantastic, beautiful music for a long, long time. The wonderful, fantastic, beautiful music is quite rare. So, hearing the music of Aska and Amy was one of those startling transcendent moments. I have known and loved Amy’s harp playing for many years, going back to the 1980’s when she played harp in the Nutcracker Ballet. She was a really good classical harpist. But in the intervening years she has transcended herself. Her playing has become an improvisational expression that is consistently an amazing musical and spiritual experience. 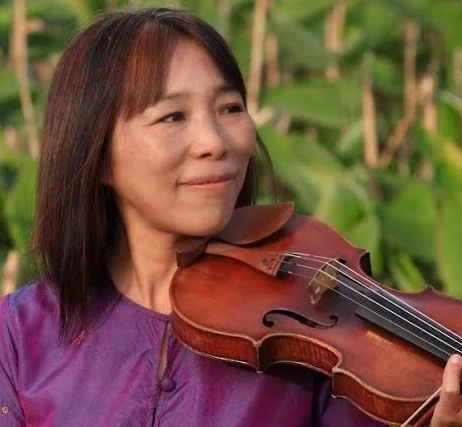 Aska is a truly amazing and gifted violinist. Her technique is flawless. Her sound is smooth and beautiful. And her soul directs every moment of her musical energy. When I say her technique is flawless it doesn’t begin to describe what she can do on the violin. She plays the softest, most beautiful melodies, creating moments of time stopping beauty, and then, still within the moment of perfect tranquility, she begins an amazing passage of astonishing technical virtuosity that sounds as if it comes from the same serene place, effortless, flawless, totally at ease, then back to the soft place. Aska and Amy together have created a new and beautiful sound, the harp and the violin blending together, dancing together in a way that I promise you have never heard before. Rarely can we say that music is a new experience, but this is exactly that: a new experience. Their music takes us on a tour of cosmic energies, expressing universal truths in a musical language that cannot be described in words. And it is beautiful and exciting, transcendent and uplifting in a totally unique way. 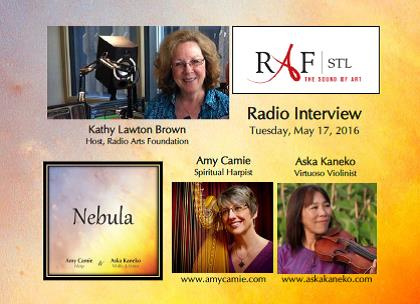 When you hear their CD, Nebula, you will realize that this is a new and important music. Nebula is a good name for the CD. A Nebula is the birthplace of stars, the building of our universe. 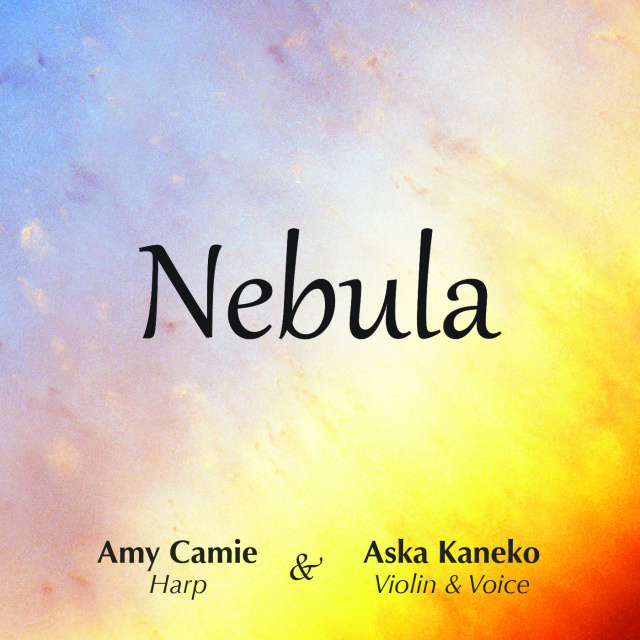 There is a creative energy in Amy and Aska’s Nebula that is building a universe of consciousness, beautiful, transcendent, and above all, enjoyable. After all, that’s what the true artist strives for, to lift the spirit, create the beautiful, enrich our lives. That is what Amy and Aska have done in Nebula.